Happy Canada Day!Sorry for the silence lately! I just came back from an unforgettable week-long trip to the Canadian Rockies.Summer is a beautiful time to visit this area northwest of Calgary, where the days are super long (the sky didn’t get dark until after 11PM!) and the weather is just a tad cooler. 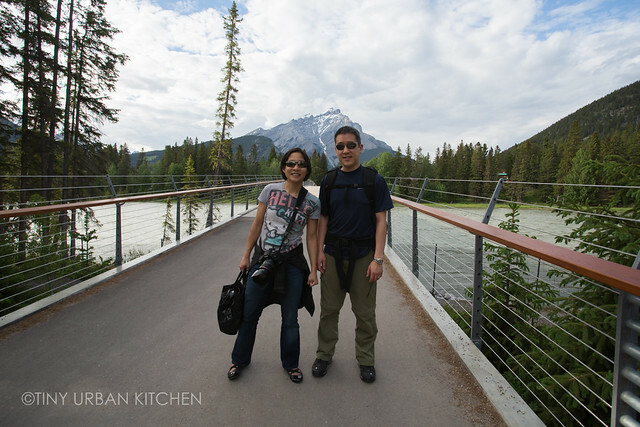 We visited Banff National Park, The Columbia Ice Fields, and Jasper National Park. The scenery is breathtaking, the hiking trails are great, and the neighboring towns are friendly, walkable, and actually have pretty good food!Here’s a little preview of various places we visited. It’s by no means comprehensive, but gives you an idea of how beautiful the area is. I’m considering writing a few posts about my favorite places to visit at the parks. It wouldn’t be food related, but more directed towards some of my favorite trails to hike. Let me know if you’d be interested in seeing these types of posts!Of course, this being a food blog, I will also summarize some of our favorite eats in Banff and Jasper. I wasn’t sure what food would be like near national parks, but I was pleasantly surprised. Onto some stunning Canadian scenery . . . The city of Banff is a natural starting point from which to explore Banff National Park. It’s a cute mountainside town filled with restaurants, sports/adventure shops, and vacation lodging. Banff is right at the foot of several mountains, a river, and waterfalls, so you can actually do quite a bit of hiking without even getting into a car if you stay in Banff (which is what we did). In fact, Bryan’s sister, who’s a marathoner, would get up every morning at 5AM to run up and down Tunnel Mountain for her training runs (before a whole day of hiking with the family!). 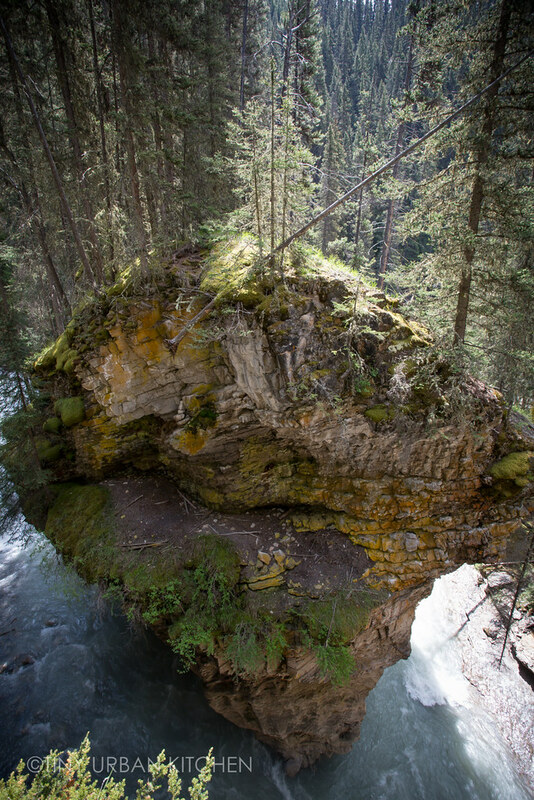 Johnston Canyon is a mere 30 minute drive from Banff and is a gorgeous hike. These super tall tree-topped rock formations reminds me of the mystical mountains in the movie Avatar. This canyon is narrow because, unlike the wide glacier carved canyons, it started with tree roots cracking the stone just enough so that water could get through. The water has been carving this canyon for ages, resulting in these beautiful, tall formations. Lake Louise, which is about an hour from Banff, is one of the most famous sites in the Canadian Rockies, and for good reason. The stunning, aquamarine lake is surrounded by glacial mountains. The views are stunning. My favorite part of Lake Louise, however, involved getting away from the packed, tourist-filled areas and hiking the Plain of Six Glaciers trail. This 8-mile hike is filled with soaring, panoramic views of the mountains and glaciers. Sometimes the path is slightly treacherous . . .
. . . but the views, (see Lake Louise in the background) are so worth it – even during a rainstorm! Definitely one of my favorite hikes this trip. Oh – I forgot to mention the best part! There’s a tea house at the top of the mountain about half way through the hike. It’s such a reward after hiking for 4 miles to come upon a tea house where you can order hot soup (made with a propane gas range! ), sandwiches made with freshly baked bread, and hot tea. Another very famous lake in Banff is Lake Moraine, which also has the surreal and seemingly unreal turquoise colored lake. Finally, Peyto Lake has got to be the most intensely colored lake I saw this trip. It’s the type of lake that looks almost fake when you first look at it – it’s so turquoise! I heard multiple people gasp as they first set their eyes upon this view. After 3 days in Banff, we drove along the Ice Fields Parkway, a 144-mile stretch between Banff and Jasper that has been hailed by many as the most beautiful highway in the world, filled with endless panoramas of all different types of mountains. Across the way from the actual glacier, we hiked another trial, the Wilcox Pass, which turned out to be another one of my favorite trails. We were short on time at this point, so we weren’t able to finish the entire 4 km trail. However, even the views from the first 1-2 km were magnificent. After a short but steep climb, you can look across and get a really good view of the huge Athabasca Glacier. It’s hard to tell from the photo, but this glacier is actually almost 4 miles long and up to 1000 feet thick. Sadly, it has been shrinking about 15 feet a year, and has receded close to a mile in the past 125 years. Some say it may disappear within our lifetime. We stayed in the town of Jasper for three days. The weather changed so quickly (lots of fast moving clouds!) that I saw some of the most incredible rainbows I’d ever seen. We found Jasper National Park to be less crowded, less touristy, and more remote. We saw much more interesting wildlife in Jasper than in Banff. Here are some mountain goats hanging out by the lake (and checking out the Camry in front of us, ha ha). A marmot on a hike at Mount Edith Cavell (yet another stunning hike with phenomenal views of Angel glacier). Here’s a side view of Angel Glacier from the Mount Edith Cavell trail. Another critter we saw on the same hike. I’m not sure what this animal is. Does anyone have a guess? Maligne Lake in Jasper was touted as a “must-see”, and you can see why. It took a 45-minute boat ride to reach Spirit Island (we didn’t have time to kayak there, which would have been more fun, less touristy, and less expensive), but the views are still so worth it. There are tons of pretty waterfalls all around the parks. This one, called Suwapta Falls, is a bit more unusual because of the little tree-filled island at the top of the falls. I love the Canadian Rockies. I really do. I would come back in heartbeat. There are so many more trails I want to hike, mountains I want to climb, and rivers/lakes I wanted to explore. I met people who chose to move there to work, just so they can explore this magical place during their time off. Now with travel out of the way, hopefully I can get back to more regularly blogging again. I can’t believe June is already over! It seems like just yesterday I was cranking out those 31 posts in 31 days. I don’t have any major trips planned for the next several months, so hopefully I’ll be able to write more often! That’s a pine marten! And I’m incredibly blown away by your pictures – I’ve been to Banff quite a bit when visiting family, but only in winter, which is a completely different world. I’d love to hear more about the hikes! Ahhhh so pretty!!!! I really want to see turquoise water sometime! If you are looking for a trip you guys can come visit us in upstate NY! Ha! Hee hee, maybe! How long is the drive to Boston? Thanks! Banff in the winter must be very cold and dark?? Hi Jen! I a so glad you made it to my backyard. I am so lucky to live in such a beautiful place you sometimes take it for granted. Your pictures were just stunning. We go to Lake Louise every January and stay at the Chateau for the ice carving competition which is a big event with the best carvers from around the world. It is sure something to see. We even got engaged at Johnson Canyon and stayed in the cabins there. Hard to believe but they have a good restaurant there as well 🙂 I look forward to seeing more! I LOVE your backyard!! You are so lucky to have such easy access to one of the most beautiful places in the world. Someday I hope to be able to stay at the chateau – that view is phenomenal.